Delicious. The perfect shade of pumpkin orange. 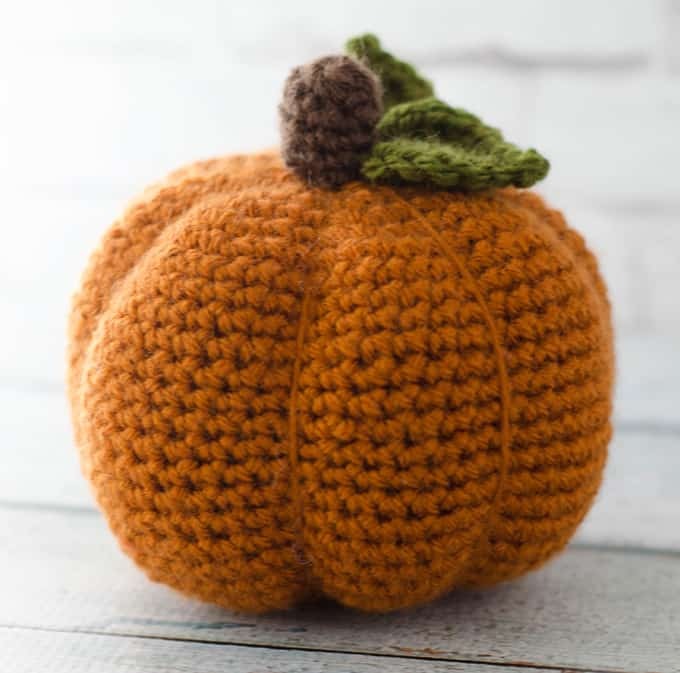 A tall and stately fellow, this darling large crochet pumpkin rounds out my trio of pumpkin patterns, perfect for decorating your home for fall. When I designed the small crochet pumpkin and it’s big sister medium pumpkin with the cutie pie tendril, I always knew a 3rd, large crochet pumpkin was destined to complete the trio. But fall got away from me last year, it seems, and I never did get to that larger pumpkin. Until now. Until THIS GUY! And now, finally the set is complete! 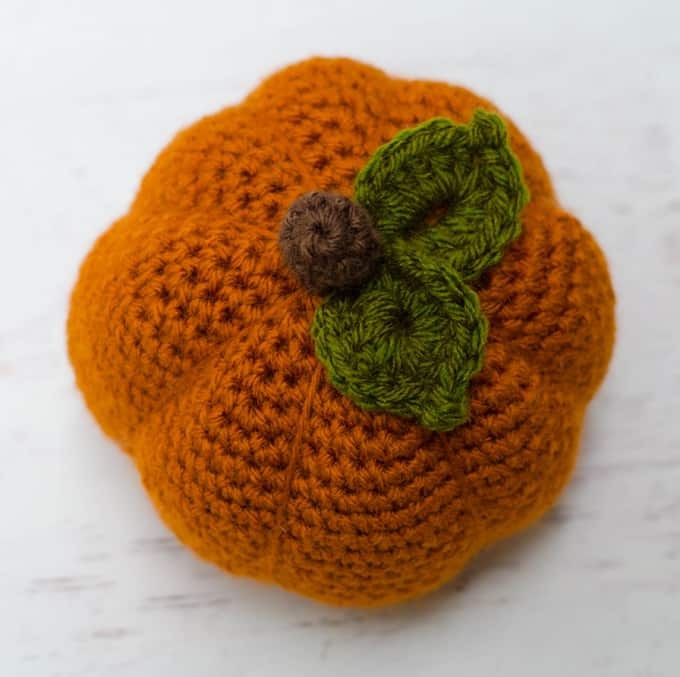 These pumpkins are some of the easiest and most satisfying crochet patterns you can make. There’s the mindless crocheting in the round. The stuffing and shaping which always makes me feel immensely satisfied, as though I’ve accomplished an amazing feat. And then the sewing on of the final touches, which completely “makes” these pumpkins something special. In an evening or two, you’ve transformed your house with a touch of fall goodness that’s not too overstated. No jarring, clashing colors. Just a simple sharing of bounty, as if you’re ushering in fall with a gentle whisper to ease the transition from warm, sunny summer days to cool, crisp ones. 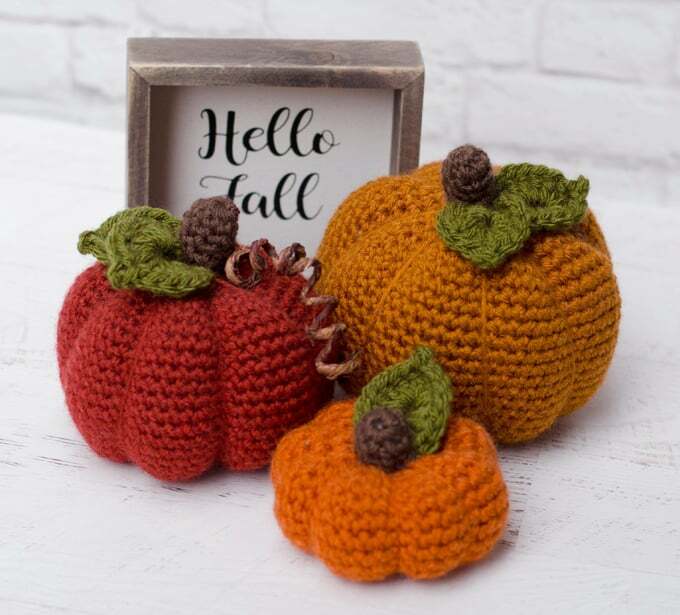 So maybe you’d like to say ‘Hello’ to fall too by crocheting up a crochet pumpkin or two or three of your own! I hope they brighten up your home just like they are brightening up mine! 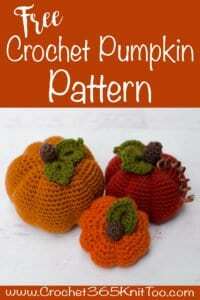 Interested in ALL 3 Crochet Pumpkin Patterns? You can buy an ad-free printable version here! 2.5 ounces worsted weight yarn in Orange, green and brown. I used Vanna’s Choice in Terra Cotta and scrap yarn for green and brown. R26: sc 2 tog around (8 st) Fasten off, leaving a long tail for sewing segments. Stuff the pumpkin. Gather up and close the opening. This pumpkin goes together just like the medium pumpkin. The sections are wrapped around the outside. Wrap yarn over and around pumpkin to starting point to divide pumpkin in half. Pull tight and knot at center. Now divide in half again to form 4 equal sections, wrapping the yarn up and around. Loop under the knot you made and tighten it up. Knot whenever you feel like you need to hold the yarn and the end of a wrap. Divide the pumpkin 2 more times to have a total of 8 sections. Knot securely at center and finish off. At this point you have a choice which side of your crochet pumpkin you want to show as the top and which to show as the bottom. Decide which you’d like for the top and move on to making the stem and leaves! R1: Make a magic ring and work 8 sc. R2-5: sc around. At end of 3rd round, slip stitch to next stitch and finish off, leaving a long strand for sewing. Stuff. *Chain 8 and join to form ring. R1 in the ring just made work all of the following: ch 2, 6 dc, ch 3, sl st to 1st ch, 6 dc, ch 2, sl st.* One leaf made. Do NOT fasten off. Repeat from * to * to make a 2nd leaf. Fasten off, leaving a long strand for sewing. Sew the leaf and stem in place on top of the pumpkin. I love seeing your finished projects! If you enjoyed making the large crochet pumpkin, I’d love to see yours on Instagram, be sure to tag me @crochet365knittoo. If you are on Facebook, stop over to the Crochet 365 Knit Too Facebook page and share a photo! I’d love to see your work! 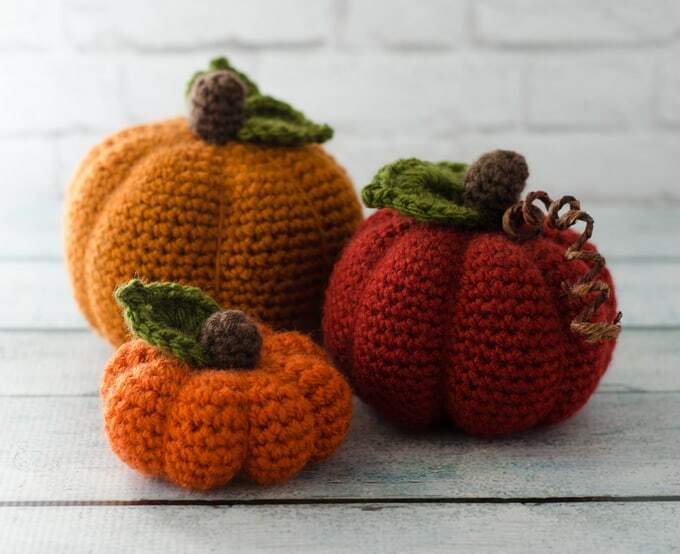 Purchase an ad-free printable version of all 3 crochet pumpkin patterns! Written pattern copyright Cheryl Bennett 2018, all rights reserved. Please do not reprint or repost this pattern. 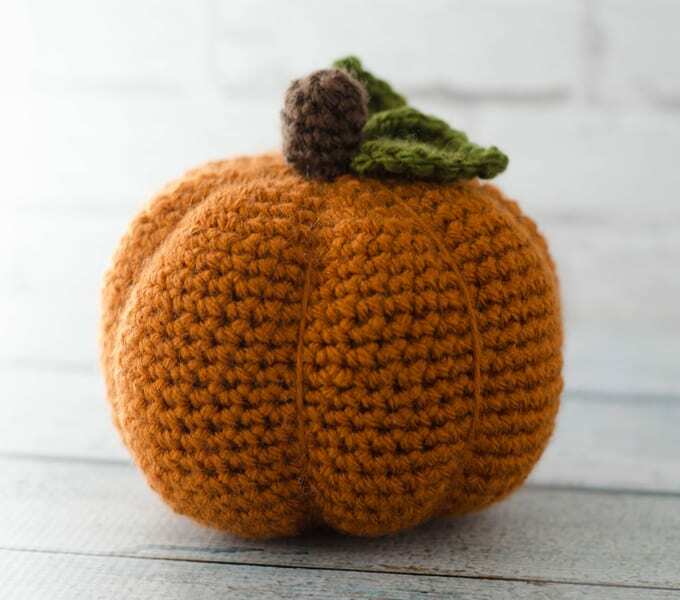 If you would like to share this Large Crochet Pumpkin Pattern with others, just link to this page. If you’d like to make items for sale from this pattern, please visit my About page for more information. Oh, what very nice pumpkins. I love this decoration.